Today, we’re moving on to real and simulated turquoise/green stones for your statement necklace. With statement necklaces, you don’t want to have just one color or style. Mixing it up will ensure that no matter what outfit or color you’re wearing, you’ll have a matching statement piece that can really elevate your style and look. 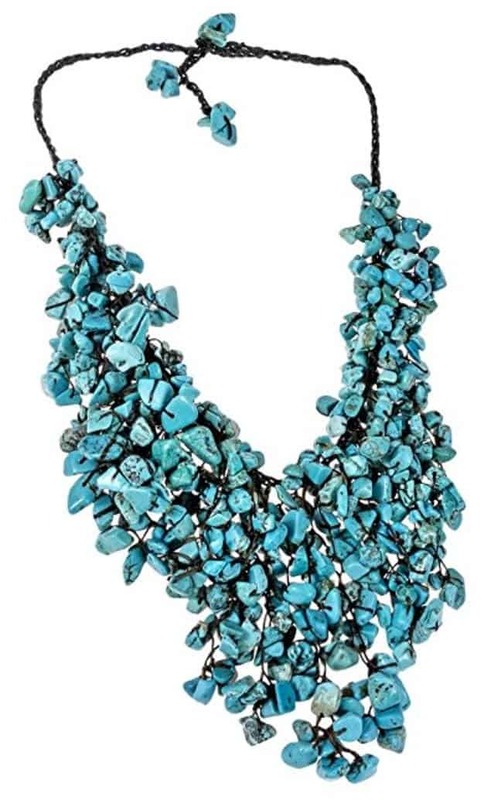 This simulated turquoise piece is a waterfall of turquoise nuggets that’s wild and beautiful. The colors are a stunning cyan blue-green, and the piece weighs 89 grams. The necklace is 17 inches long with 2.25 inches of extension. The stones drop 3.94 inches at its peak length. 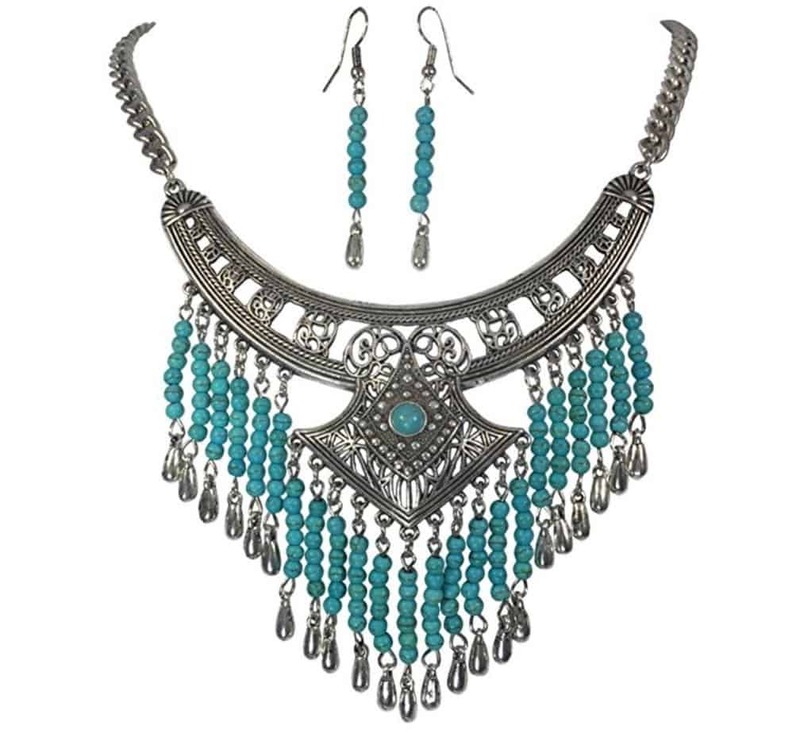 When you think of turquoise, you’ll likely think of a southwestern style, and this fringe piece is perfct for that. It’s actually a set with a pair of earrings, too. It’s a simulated turquoise with silver toned accents. It shouldn’t be worn constantly since it’s not real silver, but it’s a beautiful piece for heading out to a bar for the night. You’ll get plenty of compliments on this fringe look. This beautiful pendant can be added to any style chain. It’s genuine turquoise as well as real sterling silver. It measures 6 1/4 inches long by 1 5/8 inches wide. The sterling silver is stamped with a variety of symbols to give it a truly unique, stylish appearance. It can be used as a pin and it comes with a bale so you can add it to your favorite necklace for a designer style. This American West necklace was created by Carolyn Pollack Sterling Jewelry. 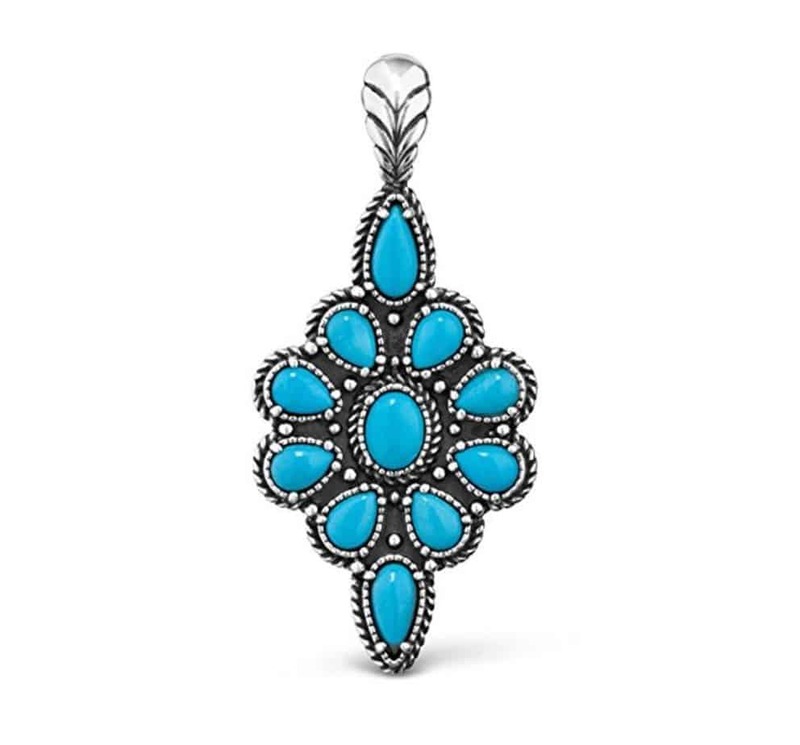 It’s made with real, genuine turquoise and sterling silver. The 18 inch necklace itself is interlocking smooth and rope style chains that meet at the beautiful 1 inch butterfly. 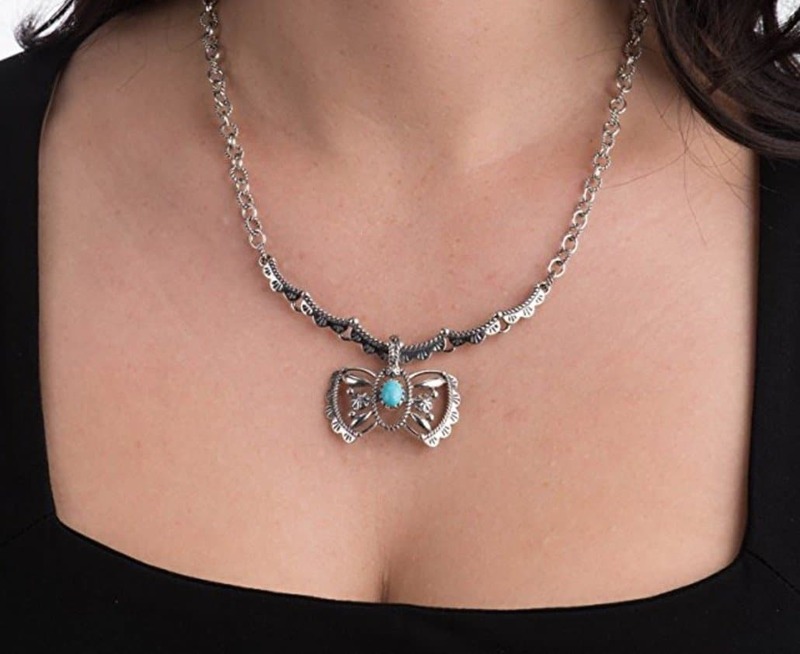 The center of the butterfly features a stunning cabochon turquoise stone surrounded by intricate, detailed silver. 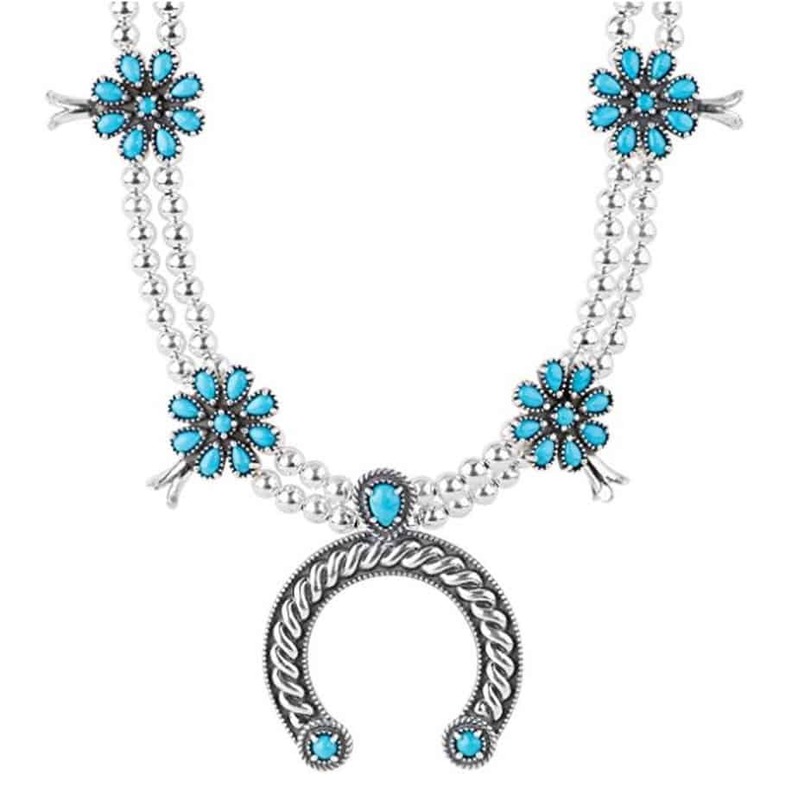 This necklace has a mixture of turquoise and crystals in a variety of colors. The predominant hue is gray with blue accents. The necklace measures 19.7 inches and is a width of 1.5 inches. The metal of the necklace is rhodium plated for a stunning shine. It’s very lightweight considering the size and amount of stones attached. This makes a great addition to your outfit whether it’s a elegant night out with your loved one or at your wedding. 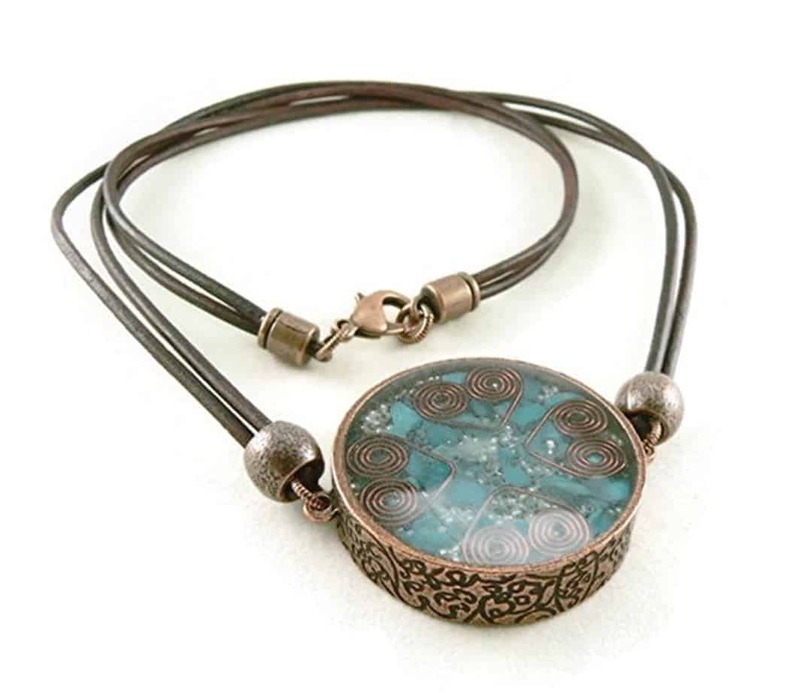 This large, open bezel pendant features quartz crystals, little pieces of silver, coils of copper and chips of turquoise. The bezel is pewter that is lead free with stunning designs engraved on the outer edge. The pendant is 1.25 inches in diameter. It hangs from a leather cord of chocolate brown and copper. Along with being a beautiful statement piece, it’s a spiritual tool that’s meant to change negative energy into positive. 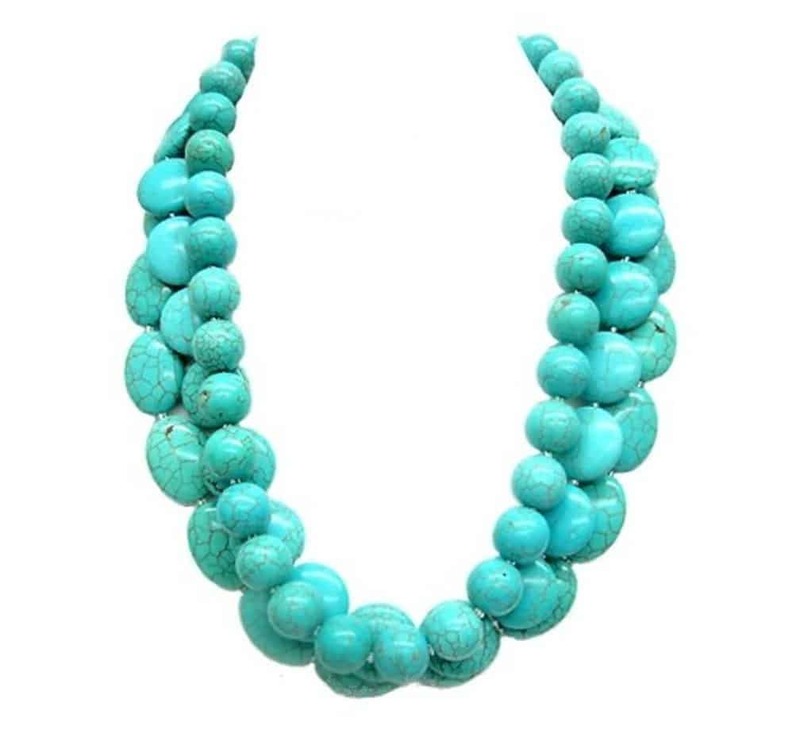 This turquoise statement necklace features multiple strands of beads with a crackle finish. They’re imitation turquoise made of glass, so they’re beautiful but not as expensive as real turquoise. The necklace measures 17.5 inches at the longest place on the piece. While it can become weighty throughout the day, it’s a solid necklace that is very comfortable for a few hours of wear. Red coral and blue-green turquoise are strung together in this necklace to create a stunning statement piece. 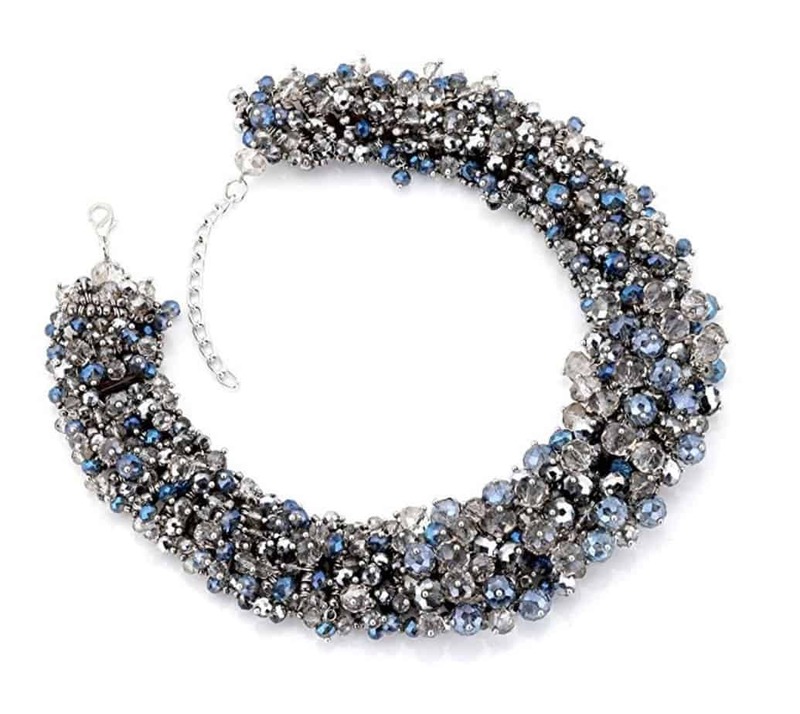 This is a necklace that can be worn with a variety of outfits whether they’re day or night, casual or formal. 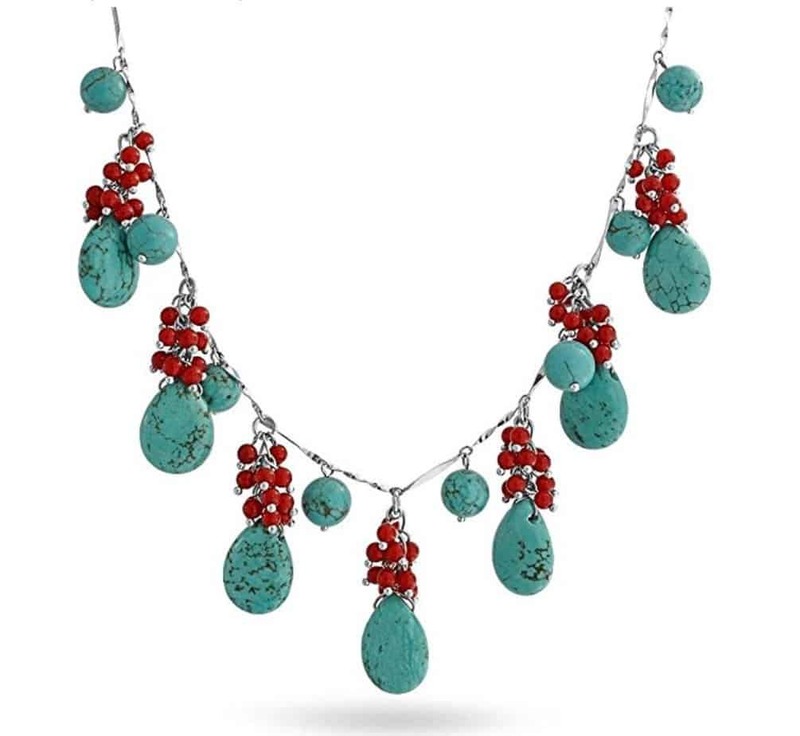 The stones are synthetic turquoise and synthetic coral on a rhodium plated brass 17 inch chain. It weighs 28.8 grams. As with other lists we’ve done, the best few were saved for last. This piece is a stunning piece from American West. It has 39 Sleeping Beauty turquoise cabochons in a squash blossom shape. The pendant can be removed for a totally different look in one piece. This piece is made with sterling silver accents and an 18 inch chain with a 2 inch extender. 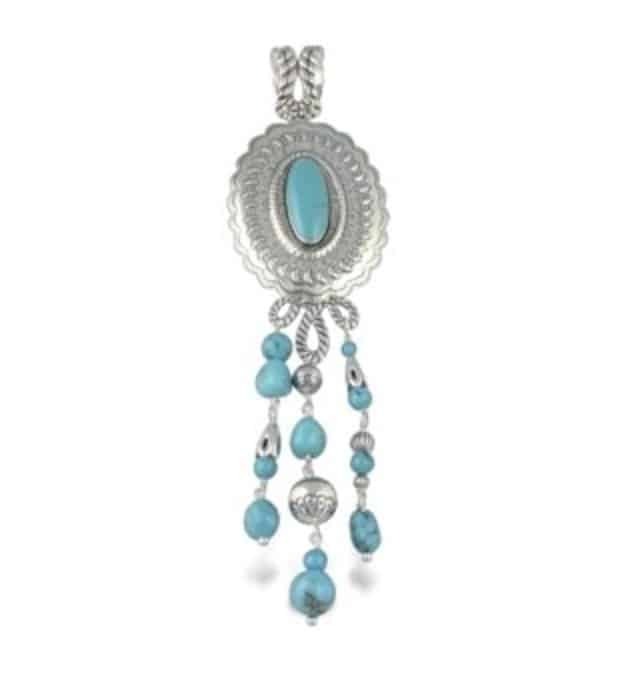 For those who love turquoise, this is an incredibly stunning statement piece. In the previous necklace, the pendant can be removed for two different looks in one piece. This enhancer fits beautifully with that necklace or on another chain of your choosing. It’s 2 1/2 inches long and 1 1/8 inches wide and features Sleeping Beauty turquoise and stamped sterling silver. The cabochons of this piece create a squash blossom that matches the previous piece perfectly. They’re both created by Carolyn Pollack Sterling Silver Jewelry. Whether you choose a simulated or real turquoise piece, you’re making a statement with one of these necklaces. They’re great for a casual or formal occasion depending on the style you choose. The beauty of statement pieces is that they match with any style outfit.